South Bend Junk Removal has a TV Disposal Service which helps residents in Indiana get rid of their old TV's. How to dispose of old TV isn't a challenge for us here at South Bend Junk Removal. Our TV pickup and disposal in South Bend Indiana take part in environmental efforts such as recycling. If you need TV recycling help, then contact us so we can set a time to pickup and deliver to the appropriate place any TV needing disposal. Were can I dispose of my old TV? This question is a common one asked by many prospective customers in the South Bend, IN area; in fact, if your TV is still working, we'll deliver it to the appropriate place which can utilize it. More importantly, there are TV's that are still in working order and charities such as the Salvation Army and Goodwill that will take your old TV. Additionally, there are various clubs and communities which have regular events that can use them too. When you need to dispose your old TV, here at South Bend Junk Removal can contact the local recycle centers which will be ha-happy to take your TV off your hands. If you have junk with a TV piled along with it and it works, contact us and we'll make it a stop to pick up and deliver it to a charity today! In addition, there are some big box electronic stores which offer electronics recycling. With so many electronics these days, gadgets and appliances can be recycled and big box electronic stores offer electronics recycling programs such as South Bend Recycling does. TV recycling is another service we offer. With TV Recycling in South Bend IN, we'll not only do the TV pickup and disposal in South Bend Indiana, but also make sure it goes in the appropriate area that it needs to be. If you don't know where to drop or recycle your TV then call South Bend Junk Removal; we'll take care of it for you safely. More importantly, recyclying old TV services is a special feat for many families. Be one of those families who care about their charities, their environment, and more so, the elimination of junk removal from your house. 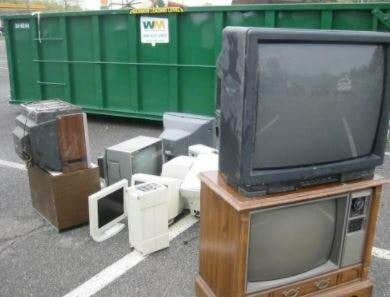 Those who need to recycle their TV's back to the community will benefit greatly. Some programs offer charity work by giving their old TVs to families and businesses who can use them. Our TV recycling in South Bend IN can deliver to these places for you so just by calling us, we'll be able to handle all the work for you. If you have a charity you would like your TV to go to, then we'll be happy to deliver it for you; call us and let us know. When you call us and give us the name and address, we'll take it from there. TV pickup and disposal in South Bend Indiana is a main service that we are proud of doing in the region. Our South Bend IN TV recycling specialists will handle everything, including the equipment that is needed to carry out any large TV's. TV recycling is a huge environmental solution and by recyclying yours when not needed, you'll not only help other families have one (if it works), but give them the same entertainment that they may have not had if they didn't have a TV. There are dozens of TV recycling centers in South Bend TV. Our recycling services will give you all that is needed for your recycling needs. Call us and we'll discuss more options if you decide to recycle your TV, working or non-working.